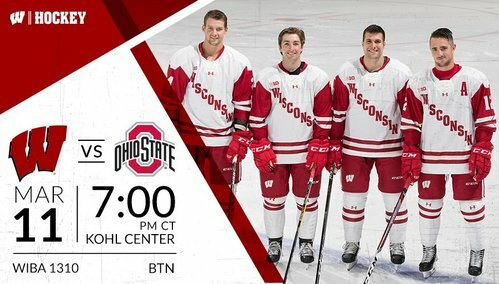 Last time out on the Kohl Center ice for these four. Let's send 'em out with a bang! Cavallini (! )-Frederic-Kunin on the first line. #Badgers senior night festivities are about to get started at the Kohl Center. Faceoff about 12 minutes away. Soleway is a senior, getting to play in final game at Kohl Center. Berry in net. No surprise, but Jurusik not dressed. Wisconsin has already locked up No. 2 seed in the Big Ten tourney next weekend, but they may be playing for NCAA Tournament berth tonight. 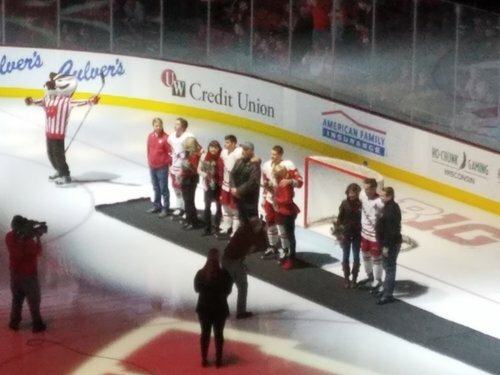 All four Badgers seniors in the lineup tonight: forwards Grant Besse, Aidan Cavallini and Jedd Soleway and defenseman Corbin McGuire. 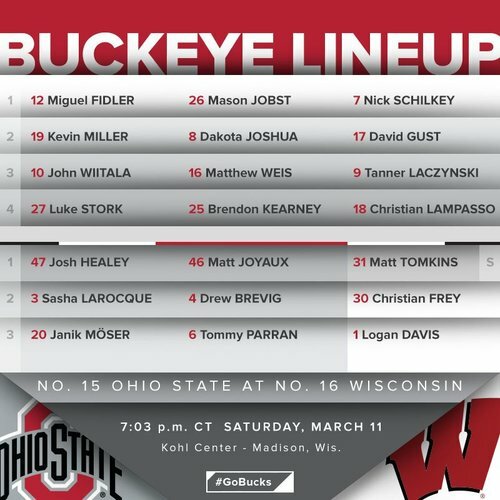 Same starters in goal as last night: Matt Tomkins for Ohio State, Jack Berry for UW. First back-to-back starts of 2017 for Berry. One minute from puck drop. 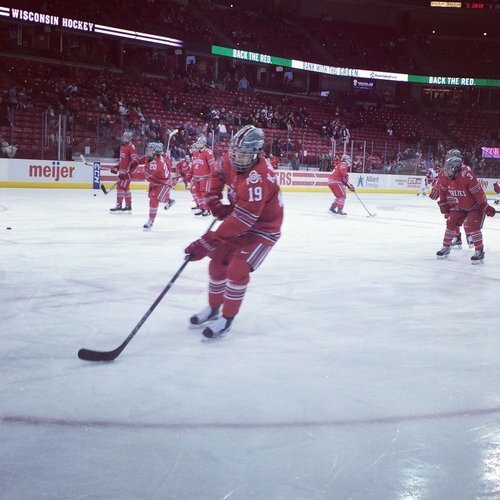 After @BadgerWHockey and @BadgerMBB , @BadgerMHockey looks for third big UW win of the day. Big stop by Berry on an early breakaway for OSU but Greenway heads to the box for slashing 1:22 into the first. Berry denies Gust on a breakaway but Greenway is sent to the box and UW's PK will be tested again. Berry stops Gust on a breakaway, but UW's Greenway is called for slashing. OSU gets the game's first power play, 1:22 in. Buckeyes cash in on the power play to make it 1-0. 17:14 to play in the first. Mason Jobst is an absolute Badger killer. 1-0 OSU, power play goal, under three minutes into the first. BUCKEYES GOAL: Mason Jobst scores on the power play, and OSU leads UW 1-0. Or, as the scoreboard says, 99-0. Might feel that way for UW. Linhart tripped up and Badgers will go to the power play. 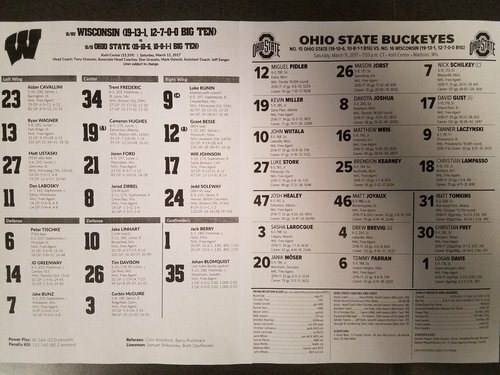 Badgers headed to their first power play as OSU is called for tripping. Ohio State's Joshua is called for tripping Linhart, and UW will have its first power play with 14:27 left in the first, trailing 1-0. Dakota Joshua has spent quite a bit of time in the penalty box this weekend. Besse with a high-quality chance from the center of the zone but he can't sneak it past Tomkins. UW comes up empty on the man advantage. 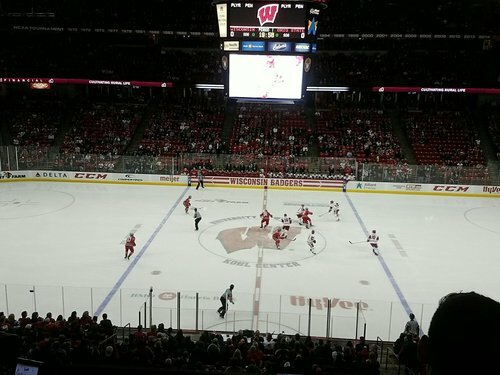 Badgers trail 1-0 with just over 12 left in the period. Johnson with a beautiful dish to Wagner but he couldn't corral the puck for a shot. Ryan Wanger with an impressive shift for UW. 1-0 OSU, they lead 5-4 in shots. UW's Wagner has a good (long) shift but it ends with his shot being deflected over the glass. OSU leads 1-0, 8:49 left in the first. Badgers still looking for the equalizer with 6:24 left in the period. OSU leads SOG 7-6. 1-0 OSU, under four minutes in opening frame. 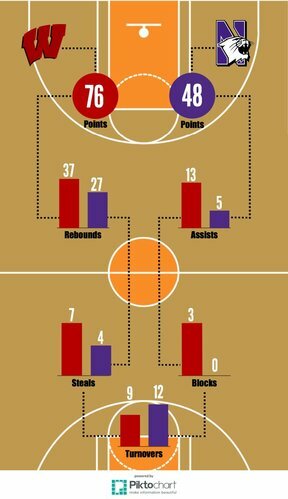 Back and forth action thus far. UW has much more energy tonight. 3:48 left in the first, OSU leads UW 1-0. No shots on goal yet for the Badgers top line of Cavallini, Frederic and Kunin. 1:50 left in the first, OSU leads 1-0. UW's Tischke laid down to block OSU's Fidler, who was the trailer on a 3-on-2 rush. Schilkey denied a breakaway opportunity as he was juuuuust offsides before getting the puck. Janik Moser and Jedd Soleway exchange some friendly conversation about the weather.